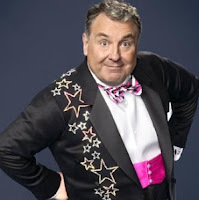 Russell Grant was plagued by an injured knee when he was appearing in Strictly Come Dancing last year. He put off an operation to carry on appearing in the show and is currently playing the Wizard of Oz at the London Palladium but his knee hasn’t held out as hoped and he has to have an emergency operation on Saturday. He is starting physio on Tuesday and aiming to back in the Land of Oz week commencing 22nd March. He is contracted to stay with show until 13th May. UPDATE: Happily Russell made a good recovery from his op and returned to the land of Oz on the 22nd as planned. Because of the emergency knee operation he will not now be doing HMS Pinafore.